Six seismologists were finally acquitted last month after they made rash comments before Aquila earthquake of 2009. They were victims of unreasonable expectations and not scientific ignorance. At 3am on 6 April 2009, an earthquake measuring 6.2 on the Richter scale devastated the medieval city of L’Aquila in the Apennine Mountains of central Italy. Over three hundred people died and the city’s cultural treasures were left in a parlous state. But it is events that unfolded shortly before the quake that have continued to attract worldwide attention. Six days before the disaster, a government committee of six seismologists and a public official tried to dampen down fears that an earthquake was imminent. In particular, the one member of the committee who was not a scientist, Bernardo De Bernardinis, stated that there was “no danger”. In 2012, a local court convicted the committee members of involuntary manslaughter. When they were first charged, numerous professors, decorated with the weightiest of credentials, wrote letters attacking the prosecutors. Putting these men on trial was an affront to the dignity of science, they cried. When the seven were found guilty, the cacophony of outrage doubled in volume. The Aquila seven joined Galileo as paradigms of scientific martyrdom. The wheels of Italian justice turn extremely slowly and only now have appeals against the decision of the local court been handed down. The six scientists have had their convictions quashed, but that of De Bernardinis, who said there was no danger, was upheld. Further appeals are still possible. So what was really going on? The world’s media misreported the 2012 trial with an even greater level on ineptitude than usual. No prosecutor had alleged that failing to predict the earthquake was a criminal offence. This was because predicting an earthquake is impossible. The record of failure is long and inglorious. We’ve only recently found out why earthquakes happen at all. Aristotle thought they were a result of vapours escaping from the soil. In the eighteenth century, some theorists blamed lightning strikes. The development of plate tectonics in the early-twentieth century means that we now understand what causes the ground to shake. But mainstream geologists long derided this theory and it only achieved widespread acceptance in the 1950s. Prediction remains a pipedream. Studies of animals have found that, while they can act strangely before a major quake, plenty of more innocent occasions set off the same behaviour. A retired engineer claimed that an earthquake was looming at L’Aquila because he was picking up higher readings of a radioactive gas. But again, this also happens when no earthquake is due. Foreshocks, such as those felt at L’Aquila, occur before about half of large quakes. In contrast, large quakes only follow foreshocks about one occasion in fifty. Thus, major seismic events do give some warning signs. It’s just that those warnings don’t usually presage a serious earthquake. In the jargon, “false positives” are far more common than true predictors. Just imagine if scientists demanded the evacuation of Los Angeles, promising the big one was around the corner, and then nothing happened. That is the most likely outcome given the current state of knowledge. So, the seven Italians were not convicted of failing to predict the disaster in L’Aquila. Rather they were accused of going about their duties negligently. And negligence that causes death is often characterised as manslaughter. Given De Benardinis assured the public they were completely safe, the failure of his appeal seems fair. But the seismologists were in the impossible position of not knowing what the risk was, just that it probably wasn’t very great. One question the case raises is the extent to which scientists should be held accountable. The implication of many of the L’Aquila seven’s defenders is that scientists should be given carte blanche to say what they like. Anything else would obstruct free enquiry. But that can’t be right. A scientist who carried out their work without due care or made off-the-cuff pronouncements would surely be culpable. Given that we cannot predict earthquakes, a confident statement that no earthquake was due would be as bad as saying that it was imminent. As in many other fields, an honest mistake is a defence, but negligence is not. Scientists enjoy the status of latter-day sages. Many imagine that their methods provide the only road to truth, not only in physics and biology, but in the social sciences as well. So perhaps the message from L’Aquila is that in making those claims, scientists unintentionally erect expectations that they cannot possibly meet. Still, there is another way of looking at the case of L’Aquila. The government set up a committee to advise on earthquakes and people of the city felt betrayed when it failed to protect them. No matter that the state could no more control the ground than Canute could the tide. Like so many westerners, the citizens of L’Aquila thought that their government was an indomitable Leviathan. The media fuels this mood with its constant refrain that “something must be done” even when there is patently nothing that can be. So grandiose has the rhetoric of the state become, that people imagine the reality should match the words. Even in a country like Italy where the government is so self-evidently incompetent, it is still expected to be in control of events that are intrinsically beyond control. Extending the scope of a government’s tasks to scientifically impossible tasks such as earthquake prediction is only a small step further from expecting it to achieve the economically impossible by “kick-starting the economy” or the mathematically illogical task of preserving generous entitlements without raising taxes or cutting other spending. We have come to expect too much from our politicians and our scientists. What it needed is for both professions to become more humble. Otherwise, they can expect to be severely punished if they can’t live up to their rhetoric. 1. It's arranged topically, not historically. 2. It nevertheless deals with these topics by going over how various thinkers throughout history have addressed them -- although not exhaustively of course. 3. It's actually introductory, for people who haven't taken philosophy before. I had used Does the Center Hold? but it's chapter on metaphysics was exclusively on philosophy of mind (not really dealing with space and time, causality, etc. ), and the chapter on philosophy of religion was just terrible. Anyone have any ideas? “Are mystical experiences real?” asks Joe Hinman in his new book, The Trace of God: A Rational Warrant for Belief. It should not be too much of a spoiler to reveal that he concludes that they are. Joe has distilled the research on mysticism since William James to determine the commonalities of these experiences and to ask how much they can tell us about aspects of reality not readily accessible to everyday experience. There are plenty of problems with studying mystical or “peak” experiences. For a start, they are highly subjective and extremely difficult to describe. Francis Spufford gives it a go in his excellent book Unapologetic, but reading about someone else’s experience is always second best. I am a decidedly non-mystical person and so I find the subject alien, if quite fascinating. Joe introduces us to Ralph Hood Jr’s “M scale” which attempts to provide a measure of mystical experience so that they can be compared and validated. In fact, it turns out that there has been a great deal more work in this area than your might imagine. This has revealed uniformities that mean we can certainly group these experiences into a single category. But are they real? The standard rationalist response is to dismiss mysticism was something that goes on inside our heads, often aided by illicit chemicals. It has no external cause and so it is of interest to neurologists and hippies only. It certainly can’t tell us anything about God. As Joe explains, the problem with this dismissal is that all our experiences are ultimately subjective. We never enjoy unmediated access to reality, but only the most radical solipsist would claim this means that reality doesn’t exist. We know when we are awake and quite often know when we are dreaming. Mysticism isn’t like that – it feels more real than everyday life. Still, the strength of science, says the rationalist, is that it overcomes subjectivism by insisting on repeatability. Joe marshals Thomas Kuhn and other sociologists of science to argue that scientists are just as prone to herd mentality as the rest of us. I’m not sure this goes far enough to mean a mystical experience can claim parity of subjectivity with a laboratory experiment. But Joe doesn’t want to take things that far. He just argues that the mere fact that mystical life is subjective does not rule it out of court as a valid experience from which we can extrapolate knowledge. His basic argument is that we are justified in accepting religious truths on the ground of our own experiences (what is called the “religious a priori”). Thus, mysticism can provide us for a rational warrant for religious belief. The bulk of The Trace of God is taken up by detailed rebuttals of sceptical arguments against mysticism: that it is just emotions and feelings, caused by drugs or brain chemistry. Joe blunts these arguments, but he would be the first to admit that he has not proved that mystic experiences are not purely internal. However, by showing that rationalists cannot invalidate mysticism, he leaves the road open to his own argument: these experiences are evidence of God in the way that a footprint is evidence of a wild animal. Mysticism provides a trace that gives us a rational warrant to postulate the existence of the being that gave rise to the spoor. We’re not dealing in proof here. In that respect, Joe’s project is similar to Alvin Plantinga’s work on warrant. But whereas Plantinga floats his justifications on rarefied philosophical air, Joe builds on the solid ground of widely experienced phenomena. No one, as far as I am aware, believes in God because of philosophy. Plenty of people base their religious faith on mystical experience. This leaves us with two difficult questions: is belief in God warranted by someone else’s mystical experience? And where does religious doctrine fit into experiences that can be wildly inconsistent? Joe doesn’t really deal with the first of these. He concludes that the evidence of mysticism provides him with warrant for knowledge about God that he has anyway. It doesn’t seem to provide much evidence for the non-believer unless that non-believer is willing to invest in a religious interpretation of these experiences. As far as apologetics goes, this is a “come on in, the water’s lovely” argument. And what about doctrine? Joe, like me, is an orthodox Christian of liberal persuasion. One senses that, for him, the universal aspects of mysticism are an advantage not a problem. A Christianity that damned the rest of humanity (or worse a Christian sect that damned most Christians into the bargain) is not one that Joe or I would be comfortable with. If mystical experiences provide warrant for believing in God, they also provide evidence of God’s interest in all of humanity. Joe distinguishes between knowing God “face to face” and the knowledge of doctrine. He finds evidence for the distinction in the writings of Paul: the man who had the most famous mystical experience in history. Overall, as a first book that breaks new ground in the philosophy of religion, this book represents a considerable achievement. Joe’s publishers, Grand Viaduct, also deserve credit for helping him overcome the disadvantage of dyslexia to communicate his ideas in a format such that they might achieve the recognition they deserve. Keith Parsons: Can the arguments of the "new atheists" be made stronger? Feser: Can you explain something by appealing to "brute fact"? With Russia's sort-of invasion of Ukraine (some say it is definitely an invasion, some say it isn't), pundits on the political right are pointing out how, during the 2012 American presidential campaign, Mitt Romney was mocked by President Obama, John Kerry, and the media for suggesting that Russia was America's number one geopolitical foe. Some have looked further back to the 2008 campaign when Sarah Palin was not taken seriously when she suggested that Obama's stance towards Russia's invasion of Georgia would only encourage Putin to invade Ukraine. This latter case is bringing up another issue involving Sarah Palin and Russia that I've never understood. During the 2008 campaign, an interviewer asked her for her thoughts on Russia, given its proximity to Alaska, the state Palin was the governor of at the time. She responded that Russia and Alaska are neighbors, and that in fact you can see Russian territory from Alaskan territory, specifically an island in the Bering Strait. When I first heard this, I nodded my head. I thought it was common knowledge. 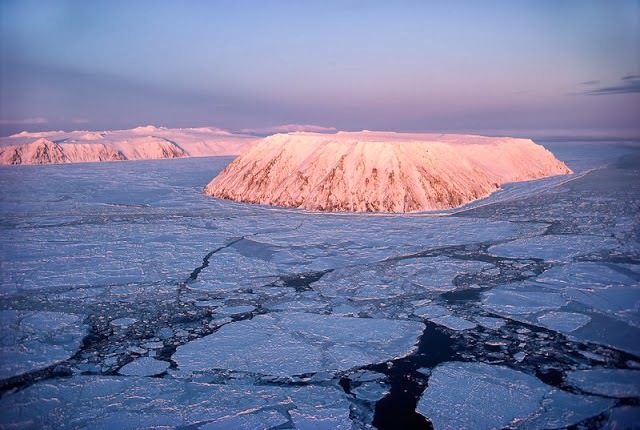 There are two islands about two and a half miles apart in the Bering Strait: the Little Diomede Island is Alaskan and the Big Diomede island is Russian. The Alaskan island has a town facing the Russian island, and the Russian island has a military base on it. The international date line goes right between the two islands, and the space between them (actually the whole Bering Strait) was known as the Ice Curtain during the Cold War. Monty Python's Michael Palin began one of his travelogues on Little Diomede Island, and tried to finish it there as well, but couldn't quite make it. I remember in the 1980s the comic strip Bloom County had a sequence about how some ignorant hicks heard that the USSR had moved within two and a half miles of American territory and were panicking about it. Lynne Cox, an American swimmer, swam between the two islands to "ease international tensions." Etc. Again, I thought this had permeated American culture and that everyone knew it -- not necessarily the names of the islands (which I didn't know), but just that there was an American island and a Russian island a couple miles apart in the Bering Strait. 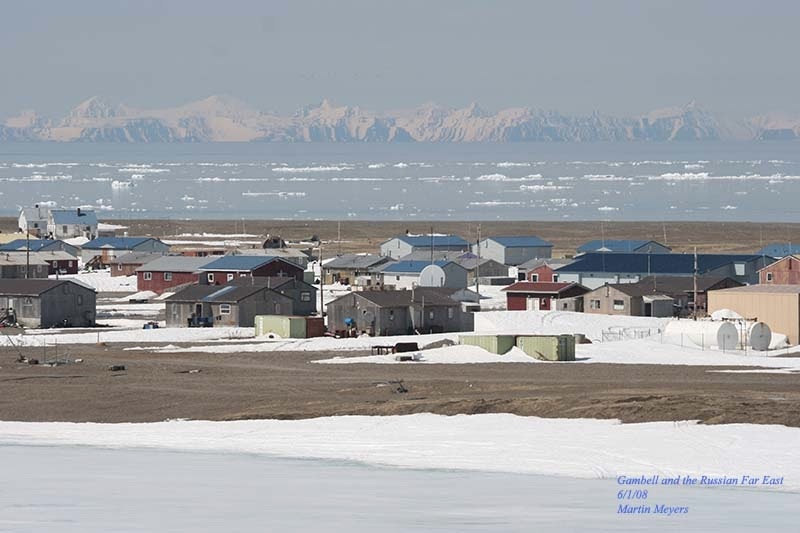 In fact, the Diomede Islands aren't the only place that Alaska and Russia are within sight of each other: "To the Russian mainland from St. Lawrence Island, a bleak ice-bound expanse the size of Long Island out in the middle of the Bering Sea, the distance is 37 miles. 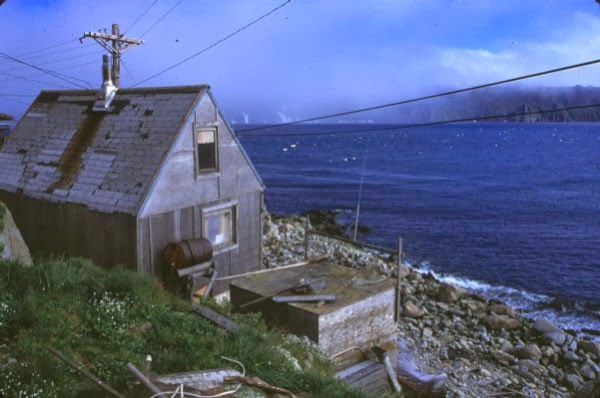 From high ground there or from the Air Force facility at Tin City atop Cape Prince of Wales, the westernmost edge of mainland North America, on a clear day you can see Siberia with the naked eye." St. Lawrence Island has two towns on it. And Tin City, as noted above, is part of the North American continent, not an island. It is the mainland, and you can see Siberia from it: "The station chief at Tin City confirms that, for roughly half the year, you can see Siberian mountain ranges from the highest part of the facility." Yet when Palin said you can see Russian territory from an Alaskan island, everyone went crazy about how stupid she was. On Saturday Night Live, Tina Fey, portraying Palin, said "I can see Russia from my house," which, incredibly, has entered the public consciousness as something Palin supposedly said. I guess if people were ignorant of the Diomede Islands -- and if they didn't realize that the proximity of mainland Russia to St. Lawrence Island and the westernmost part of the North American continent allowed an observer to see one from the other (which I was ignorant of and surprised by) -- I could understand them being skeptical of Palin's actual statement. But even if you think she's unintelligent and says foolish things in general, once you found out about these islands, why in the world wouldn't you respond by saying, "Oops, my bad, Palin was right." I mean, it's no big deal. You didn't know about a couple of islands in the Bering Sea. It's not a personality flaw. Yet Palin's statement is still held up as an example of stupidity on her part. I don't get it. Maybe it's because she supposedly used this to tout her international cred. But, again, she was asked about Russia's proximity to Alaska, and she merely confirmed it by accurately stating you could see Russian territory from Alaskan territory. I'm not defending Palin's politics at all here. My confusion about this has nothing to do with her politics or her overall intelligence or how well-informed she is. I just don't understand why an innocuous and correct statement she made in response to an interviewer specifically asking her about this subject would cause so many people to have such a strong reaction that she must be wrong. If you think she's unintelligent, fine. If you think she's wrong about politics, great. This isn't politics, it's geography. What's the source of this reaction? It's this absurd polarization, this staking out of claims, this willful blindness that makes me avoid politics as much as possible. Third, a picture taken from Tin City (presumably at the part that's over 2000 feet above sea level), which, to reiterate, is the westernmost point of the North American continent. 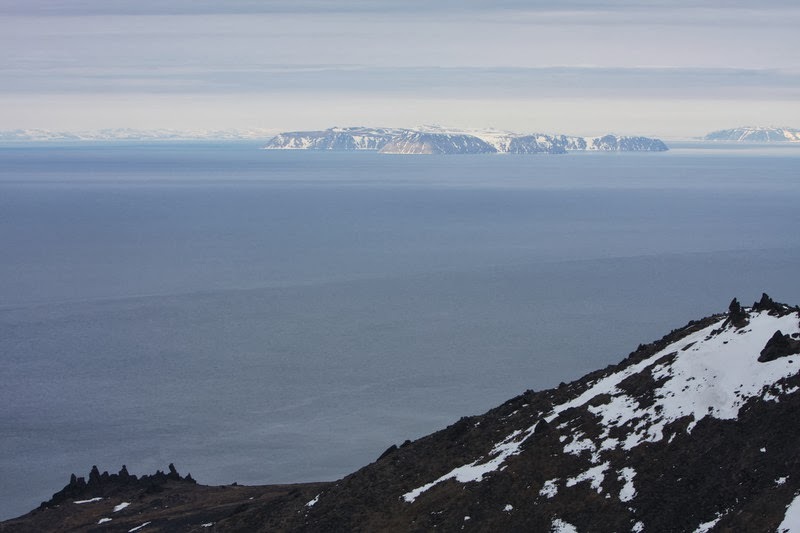 The Diomede Islands are about three-fourths up from the bottom of the picture -- Little Diomede is right in front of Big Diomede, so it's hard to distinguish them. On the upper right part of the picture is Cape Dezhnev, the easternmost point of the Asian continent, and on the upper left part of the picture is more Russia. Brainstorms: Philosophical Essays on Mind and Psychology by Daniel Dennett. I just added Dennett to my "Favorite Books" list on my profile page. Not because I agree with him, but because he has staked out the issues that I tend to move towards as well. The difference is in our assessment of the issues, but we agree on the meta issue of which issues should be addressed. I'm currently reading The Intentional Stance (I'm stuck in the far-too-long chapter "Beyond Belief" which defends his almost-but-not-quite eliminativism), and will move on to his new book afterwards, probably. Physicalism, or Something Near Enough by Jaegwon Kim. You should read everything Kim writes. He is one of the most important voices in philosophy of mind. I'd like to make a website devoted to Kim's writings, analogous to the websites Andrew Bailey has made for Alvin Plantinga, Peter van Inwagen, and others. This book, which I disagree with for the most part, is his attempt to solve the mind-body problem and mental causation, which he also addressed in his excellent Mind in a Physical World. He seems to think he is successful -- and Kim is emphatically not one of those overconfident philosophers who solves deep problems with superficial analyses -- but he says he is still left with qualia. That's why it's near enough to physicalism: he's solved the most important and difficult part, and the remainder is a difficult but nowhere near as significant issue. Reason, Metaphysics, and Mind edited by Kelly James Clark and Michael Rea. These are the proceedings from Alvin Plantinga's retirement conference. The essays aren't on Plantinga's philosophy, but rather (and I approve of this wholeheartedly) on issues that Plantinga wrote on extensively. As with any collection there are some good and some not as good, but it's definitely worth it. The Concept of Canonical Intertextuality and the Book of Daniel by Jordan Scheetz. Jordan is one of my best friends, so I'm completely biased towards this book. We went to the same school, and we both took a class on Aramaic. This is relevant because his book is a focused commentary on Daniel, one of two Old Testament books (the other being Ezra) with a significant portion written in Aramaic rather than Hebrew. This book is a short commentary, but Jordan has mastered the languages so completely, it's incredible. Some general editor compiling a new series of Bible commentaries better contact him, because if he wrote a comprehensive commentary on Daniel, it would be amazing. Simply Jesus by N.T. Wright. Very good. I need to start buying his Christian Origins and the Question of God series, seeing as how he's just published a fourth volume on Paul. Jesus and the Logic of History by Paul Barnett. I've had this book for 15 years and never read it. I finally took it off the shelf a couple months ago. It's outstanding. One very interesting point he makes is how scholars start studying Jesus with the gospels, and never move on. He suggests that we start with the New Testament epistles because the information they contain about Jesus is a) tangential to the points they're making to their audience, and b) was already accepted by the original audience -- that is, the statements were meant to remind the readers about something, or put it in a specific context they may not have thought of before. Barnett suggests this makes these statements immune to many of the methodologies used to evacuate the gospels of historical validity. The Martian by Andy Weir. My wife brought me back a pre-publication copy of this novel from a conference she attended in Chicago last month (it was officially published this month). It's about one of the first manned explorations of Mars, and one astronaut being accidentally abandoned there and struggling to survive, the hope of rescue, etc. I read a lot of science-fiction, so I'm referencing this book in lieu of a long list. My reasons for singling out this one are that a) it's a particular subject that I love: near-future exploration of the solar system; b) it threads the needle of being a very pleasant read while being nice hard science-fiction: the guy really knows the science and the technology (or at least is able to convince a layman like myself that he does). This is made all the more impressive by the fact that c) it's the author's first work. For my fellow science-fiction fans, I recommend it. Certainly Europe had been remade in 1912; just as certainly, these very trees had appeared there in a night, eight years younger than he found them now. But they did not seem new-made. They generated seed (spores, more precisely, or germinae in the new taxonomy), which implied heritage, history, descent, perhaps even evolution. Cut one of these trees across the bole and you would find annular growth rings numbering far more than eight. The annular rings might be large or small, depending on seasonal temperatures and sunlight ... depending on seasons that had happened before these plants appeared on Earth. Similarly, young earth creationists claim that God created trees with annual rings, polar ice sheets with annual layers, and coral atolls with daily band deposits for days, years, and millennia that never happened. One prominent way they do this is to suggest that when God created the stars, he also created beams of light in transit between those stars and the earth (and presumably everywhere else in the universe). Otherwise, light from stars that are more than a few thousand years away from us wouldn't have reached us yet, and so couldn't be observed. The problem here is very much the same as with tree rings that indicate weather conditions from years that, ex hypothesi, never happened. As I wrote here, when we observe light from distant objects, we don't just observe objects, we observe events. For example, astronomers regularly observe supernovae in other galaxies, millions of light years away. Now say God created the beams of light from those galaxies in transit a few thousand years ago. In that case, the light that left those galaxies immediately upon their creation would still have a long way to go before it reaches us; what we observe is just the beam God created between these galaxies and us. So when did these supernovae take place? Are they taking place now, that is, when they are observed by us? But then in a few million years, we'll see them again when the light they produce reaches us. It seems that since the light showing a supernova taking place was created in transit, these supernovae never happened. Now this scenario is extremely contrived or ad hoc. But that's not the problem I have with it: the problem I have is that it ascribes deception to God. God is painting scenes on the sky that never happened, he is manipulating the universe to make it appear differently than what it actually is. But the God of the Bible cannot lie. It's not merely that he does not (in that he's never had occasion to) or will not (in that he chooses not to) but he cannot. It is contrary to his nature. In response, I've heard young earth advocates challenge this, by suggesting that this puts God in a box. God can create any way he wants to: why should we assume that it's contrary to his inscrutable will to create, say, a car that looks rusted and dilapidated? Or take a Scriptural example: God had the Hebrews wander in a seemingly random manner in order to trick Pharaoh into thinking that they were confused and could be easily defeated (Exodus 14:1-4). So God can manipulate for purposes that will often be beyond our ken. There's two answers to this. First, it seems to me that creating something that manifestly displays properties it doesn't really have would still qualify as deception (and thus as lying). By "manifestly" I do not mean "superficial", I mean something that is not ad hoc or contrived. If you built a car but designed it to look like an old rustbucket when it actually is not, would you be trying to deceive people? Whatever reason Pharaoh had for thinking that the path the Hebrews were wandering in was random, he had a much stronger reason for thinking that God was guiding them: he had just had ten plagues visited on his nation which were explicitly revealed to be a punishment from God for his failure to let the Hebrews go. Once he let them go, they traveled in such a way to look as if they were hemmed in by the desert, but Pharaoh could not have thought that meant they could be recaptured without ignoring the much more obvious, dramatic, and explicit events that had just taken place. Perhaps I'm wrong about this though. Perhaps creating a car that looks old when it is not would not automatically count as a lie. But here's my second point: it would count as a lie if God told us the car was a reliable and trustworthy revelation from him. And this is exactly what God says of the natural world. He tells us that nature is true revelation (which is redundant) from God, which is clear and understandable to all people in all times and places -- including times and places that did not have access to the Bible or any other form of special revelation. God never told Pharaoh that he would reveal himself through the route the Hebrews would travel after their departure from Egypt, but he did tell him to let his people go. If God created a new car that looked rusted and dilapidated and then told us that this car could be trusted to reveal the truth, he would be lying, because it wouldn't reveal the truth. And God can't lie. The creation of Adam and Eve. Many argue that when God created Adam and Eve, he didn't create them as zygotes which then slowly grew to infancy, childhood, and eventually adulthood -- he created them as adults. Since they were created "full grown" they bore the appearance of an age that they didn't actually have. Now I will not argue here about how literally we are supposed to take the story in Genesis 2, I'll grant that it's literal for the sake of argument. Nor will I enter into an extensive analysis as to whether the biblical text really commits us to the claim that God created Adam and Eve as adults. I'll grant this too. Even with this, I think it is still enormously problematic to suggest that God created Adam and Eve with a false appearance of Age. This can be illustrated by asking whether Adam's and Eve's cells and organs had physical indicators that they had been alive for twenty (or so) years. For example, according to this scenario God presumably created Adam and Eve with adult-sized hearts. But it doesn't follow from this that these hearts bore the wear and tear of having been beating for twenty years -- he created them brand new, not with a false appearance of age. Let me reiterate that: they would have appeared adult-sized AND brand new. The claim that being created as adults means being created with an appearance of age presupposes that size and age are essentially the same thing. This is obviously false. Second, if the fact that they were created as adults indicated a false appearance of age, then we have opened a door we definitely do not want to go through. If Adam's and Eve's bodies bore a false appearance of age, we have no grounds for denying that their minds may have as well. In other words, God may have created Adam and Eve with false memories of childhoods which never happened. And thus, there is nothing to prevent us from maintaining the same thing of our own memories. God, in other words, would be implanting false memories into our minds. I've never seen anyone suggest anything like this, and it seems so absurd, and so blatantly contrary to God's truthful character, that I doubt any Christian would seriously propose it. But it's unavoidable that this would be a possibility if we try to argue that God's creation of Adam and Eve as adults implies that he created them with a false appearance of age. Finally, the bodies of Adam and Eve are not here for us to examine to see if they really do bear a false appearance of age. But the universe is here for us to examine. We should always try to understand the unclear in light of the clear, not the other way around. We can't employ what is, at best, a highly speculative interpretation of Scripture in order to deny the reality of the world around us. Jesus changing water into wine. At the beginning of his ministry, Jesus changed water in several jars into wine (John 2:1-11). Wine is by its very nature an aged substance. It takes time to ferment. When Jesus made wine instantaneously out of water he either radically sped up the fermentation process, or he created the wine with the appearance of having experienced the fermentation process when it had not. In either case, the wine would have borne a false appearance of age. However, it is not evident that the molecular structure of wine by itself indicates a particular age or appearance of age. The fact that alcohol is naturally produced by fermentation does not imply that if God supernaturally changes H2O molecules into alcohol molecules, he makes them with the appearance of having been produced by fermentation. Just as the previous argument equates size with age, so this argument equates molecular structure with age, which again is obviously false. I think some people who argue that changing the water to wine indicates an appearance of age are thinking of a wonderful passage by C.S. Lewis in his book Miracles about Jesus' miracles of fertility. Lewis points out that the water to wine and the multiplication of bread and fish (Mark 6:30-44; 8:1-13) are doing something in a different way that God usually does through nature. Bread is multiplied in that a single seed grows into a full plant; fish are multiplied by procreation; and water is changed to wine through the growth of grapes and fermentation. "Thus, in a certain sense, He constantly turns water into wine". Of course, it all turns on the phrase, "in a certain sense". Water, after all, doesn't ferment. The point of these miracles, Lewis argues, is that it shows that God is the God of fertility, the God of the vine, "He is the reality behind the false god Bacchus". God usually accomplishes these things through the universe he made, but he can also do it directly, "short circuit[ing] the process". To suggest that in these acts God is creating something with a false appearance of age is to completely miss the point. The miracle of changing water to wine was a miracle of transformation, not one of aging: God supernaturally changed the molecular structure of the water in the cisterns into the molecular structure of wine. In other words, God created all the elements of wine other than water and then placed them in the water. This doesn't mean that God "sped up" the natural process of fermentation any more than when someone mixes water with dehydrated wine (yes there is such a thing). Moreover, as with the bodies of Adam and Eve, the wine Jesus made from water is not present for us to examine. We simply cannot conclude, therefore, that it bore a false appearance of age. Some may think that if we deny the possibility of God creating with a false appearance of age, we are claiming that he can't speed up natural processes. But I don't claim this. God can speed up (or slow down, or change in any way he wants) the processes of nature at his discretion. My claim is merely that, if he does, the objects acted upon would bear witness to his divine intervention. Or perhaps these critics are thinking that any proposed first state can be given a naturalistic history. Thus, it is impossible for God to not create without some appearance of age. This seems to assume that God's miracles could actually occur by natural processes given enough time, just as wine, bread, and fish can be produced by natural processes. Then, when God performs a miracle, he speeds up these natural processes. I simply disagree: while some miracles may be something that could occur naturally (perhaps the miracle then being in their timing; the parting of the Sea of Reeds might be an example), this is not the case for all of them. There are some miracles that could never occur naturally without divine intervention, so they wouldn't represent a false appearance of age. Water in a jar will never turn into wine by itself no matter how much time you gave it. Natural processes will not bring a dead man back to life with a glorified body if you wait long enough. The budding of Aaron's staff. In Numbers 17, we are told that the Israelites were jealous of the special position God had given Moses and Aaron, so God had Moses take the staffs from the leaders of each of the twelve tribes and place them in the tent of meeting. The following morning, Aaron's staff had sprouted and budded, producing blossoms and ripe almonds. However, the miracle here was not that God "sped up" a natural process, but that he brought a dead piece of wood back to life. All of the reasons why the bodies of Adam and Eve and Jesus' transformation of the water into wine don't imply a false appearance of age also apply here. And just like the other two examples, we don't have Aaron's staff to examine to see if it really does exhibit a false age. How do we know that, upon closer examination, the bodies of Adam and Eve, the wine made from water, and Aaron's staff wouldn't give evidence that they had been supernaturally altered? Wouldn't it be more reasonable to conclude that God wouldn't cover up or conceal such remarkable examples of his power by making them appear normal when they weren't? None of the examples above constitute examples of God creating things with a false appearance of age, and hence we have no grounds for asserting that he may have done so with the universe as a whole. We know that creation can be trusted to reveal the truth about itself, since God has gone to such lengths to tell us that it is a revelation by which he makes himself known to humanity. If this revelation weren't trustworthy, it's inexplicable why God would tell us that it is, unless God himself is a deceiver. That is not an option for the Bible-believing Christian.